Located at the extreme western tip of Martha's Vineyard in the Native American region of Aquinnah. The grounds around lighthouse are open to the public. 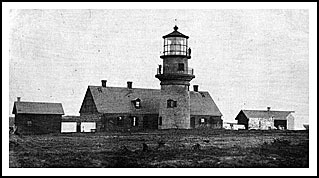 The original lighthouse was built as a wooden structure in 1799. The first Keeper was Ebenezer Skiff, who was also the first white man to live in the town of Gay Head, since all others were members of the Wampanoag Indian tribe, with generations still living there today. During his 29 years at the lighthouse, he also helped the town by becoming its teacher for their children. In 1844, with the constant eroding of the cliffs, the tower had to be moved back about 75 feet from the edge of the bluff. In 1856, the current brick and brownstone tower replaced the original wooden lighthouse built in 1799. A huge first order Fresnel lens with 1008 prisms was also installed at that time. The current Gay Head Lighthouse sits 130 feet above the sea on multicolored clay cliffs on the Western side of Martha's Vineyard, where an underwater ledge known as the Devil's Bridge with rocks that reach out from the Gay Head Cliffs threatens ships that enter into Vineyard Sound and the main route to Boston Harbor from the south. One of New England's worst marine disasters occurred from the ledge near the lighthouse with the sinking of the City of Columbus. Early one morning on January 19, 1884, the passenger steamer ran aground on Devil's Bridge, drowning 100 persons on board in less than twenty minutes in the cold freezing waters. Lighthouse Keeper Horatio N. Pease saw the accident and coordinated with Chief Simon Johnston three lifeboat crews of Gay Head Native Americans from the Gay Head Life Saving Station to rescue those that were able to hang on long enough to the rigging to be rescued, along with the crew of the Revenue Cutter Dexter, which also quickly arrived on the scene. Together they were able to save 29 survivors from the freezing waters. This coordination of branches of Lighthouse Service, Life Saving Service, and Revenue Cutter Service became one of the first successful attempts which led to many more successful future rescues. These three rescue branches evolved into our current Coast Guard in 1915. Charles Vanderhoop, an Aquinnah Wampanoag Indian, became one of the light's most popular keepers known for his openness in allowing many tourists and locals to enjoy the view from the top of gay head during his service from 1910 through 1933. In 1998, the name of the town of Gay Head was changed to Aquinnah, meaning "Land Under the Sun," to better reflect the Wampanoag heritage. Today, the Wampanoag Tribe, who are very protective of the fragile clay cliffs and its spiritual connection with the sea, owns the land surrounding Gay Head. In the fall of October 2013, the original stone foundation that contained the wooden lighthouse built in 1799 was found. This provides an opportunity to be able to calculate the rate of erosion from 1799 to the present, as the current lighthouse lies in danger of falling over the cliffs. Property has been purchased next to the beacon to move the lighthouse, and currently regional efforts are in full swing to raise 3 million dollars in funds needed to move the threatened lighthouse. It is now considered one of the most endangered lighthouses in the country. The best views of the lighthouse and cliffs are from a scenic lookout near the small strip of shops and restaurants at Gay Head operated by many of the tribal members. 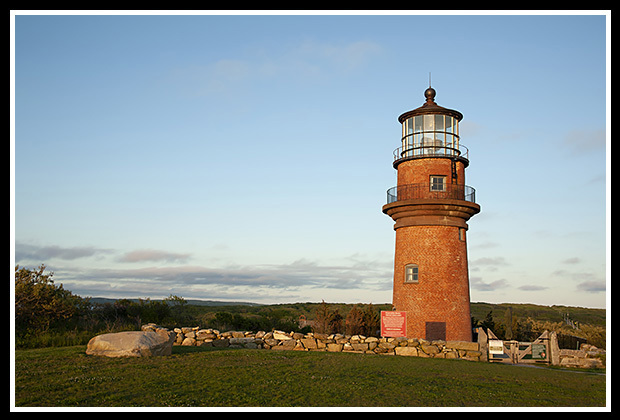 The cliffs are closed to the public because of erosion concerns, but the lighthouse is opened by the Martha's Vineyard Historical Society on weekends from just before sunset until a half hour after sunset during the summer season. Moshup Beach near Gay Head. The beaches below the cliffs of Gay Head are enjoyed by many, including nudists as a way of spiritual connectivity. The Martha’s Vineyard Museum offers sunset tours of the lighthouse area during the summer months. The original huge first order Fresnel lens can be viewed at the Martha’s Vineyard Historical Society and Museum in Edgartown. The Wampanoag tribe, one of the few federally recognized tribes in New England, offers many cultural events. 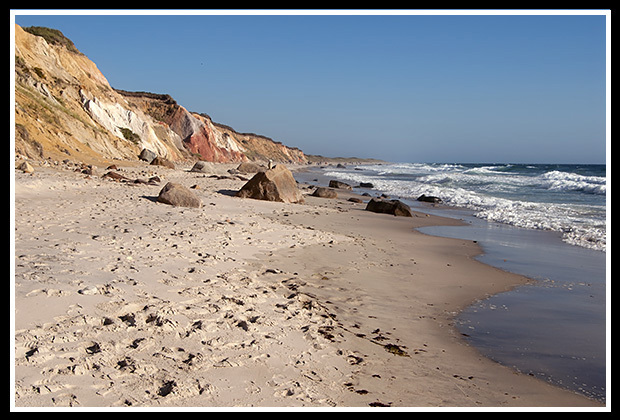 Then town of Aquinnah, bordered by the town of Chilmark are both very peaceful areas for those that prefer to enjoy quiet and solace. Chilimark has an annual road race for visitors to enjoy. From the ferry terminals at Vineyard Haven and Oak Bluffs, follow signs west to Chilmark. At Chilmark, continue west on South Road, which will end in a loop at the lighthouse. Most of the cruises mentioned below involve ferry service to take visitors to the islands from either the main land or between Nantucket and Matha's Vineyard islands. Boat cruises and ferries mentioned below may offer many types of cruises. Contact info is provided to help you plan your special trips to Martha's Vineyard. Enjoy! 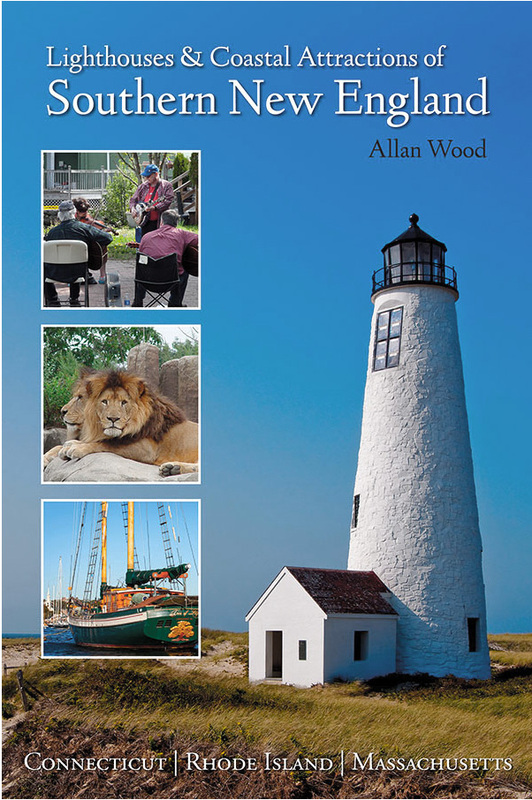 In this 300-page book, with over 360 photos, you'll find a detailed account of the rescue of the steamer City of Columbus by the Wampanoag Lifesavers of Gay Head.